There are a few things that you can put into a game to make me want it without knowing anything else about it. Rhino-men and fireballs are two of those things. Conquest Tactics has both rhinoceros people with throwing axes and wizards with the capacity to burn down your house, plus demon goblins and a bunch of other cool things. When I first heard about Conquest Tactics, I was pretty stoked. It looks great, and I really like the art style. It's an expandable card game where you play out your battles on a five-by-five grid and your cards are the warriors who cave in skulls with chunky bits of sharpened metal. That's pretty appealing - combining tactical positioning with smart card play appeals to me, and you don't have to do much else to sell it to me. Playing Conquest Tactics is straightforward enough, though it's a little involved. To keep track of what part of the turn you're in, the designers of the game invented a clever acronym - TRIUMPH!! (I added the exclamation marks. I felt two of them would be more exciting.) Each letter stands for a segment of a turn, and each player participates in each phase. That means a turn is… not very fast. But if there's enough tactical challenge, turns don't have to hurry. Give me some depth and difficult decisions, and I'll thank you for making the turns last. And there is a pretty decent amount of stuff to do, assuming you can afford it. You get these tactical points every turn, and you spend them to buy new guys and to send them all over the place. There are a lot of factors to consider, because you're going to run out of points before you run out of stuff you wish you could do. That's a big positive, if you ask me, which leaves me slightly more confused as to why I'm not flat-out apey for this game. Combat is exciting enough. One bruiser will hit the other as hard as he can, and then the other guy will counter-attack him back, and then someone else will hit someone else or shoot an arrow or throw flame or heal or maneuver into position to block or otherwise come up with some cool thing to do. For a game that's played out on a grid that maxes out at 25 combatants, there's a lot going on. In fact, that may be the first real problem I have with the game. There really is a heck of a lot happening. There's a lot to track, and yet it doesn't feel like it means as much as it should. It's like running five miles on a treadmill - you know damned well you did a whole lot, but it didn't get you anywhere. In the game, there might be some bodies piled up (hell, there probably will be some bodies), but it took too much slogging through stuff to make those corpses. Another problem, and it's not even one I'm willing to confidently say is an issue, is that it feels imbalanced. The starter comes with two decks, the Kaborha (rhino dudes) and the humans. And the rhino dudes always beat the stuffing out of the humans. It's not that the humans are pathetic - you can cast spells and stuff, and your archers tend to be impressive - but the rhinos are freaking brutal. They're a little more expensive for a lot more deadly. I could just be playing it wrong. But every time I play, it seems like the humans are playing better, with more impressive combos and good placement and better maneuvering, and the Kaborha just come charging down the field and stomp a mudhole in them. I may be missing something, but it seems like there are problems with balance. When I outplay my opponent in a game that doesn't even use any dice, I want to win, but it just seems like the better player only wins if he's the one who picked the rhinos. I can see that a whole hell of a lot of testing went into Conquest Tactics. It's got a lot to like. I love the mobilization of troops, the varying victory conditions, and the art is just plain fun. I like that the combat is brutal and the body count is high. But to really make this a sleek, exciting game, Conquest Tactics should be streamlined, and I mean a lot. There are too many pieces I don't really like, too many spots where things don't work as well as I want them to work, and too many times when I wonder why I didn't just play the rhino dudes so I could win. Conquest Tactics has all the makings of a really fun game. I can't say I hate it, but I also couldn't admit to wanting to play again. A very analytical gamer with a taste for fantasy might love it, and I'm confident that there are plenty of fans who enjoy building decks and playing the game. It won't be a big hit at my house, but it might be at yours. I wish I could be more definitive, but Conquest Tactics falls squarely in the middle of the road, and it's hard to form a black-and-white, yes-or-no opinion when I just kind of don't care either way. 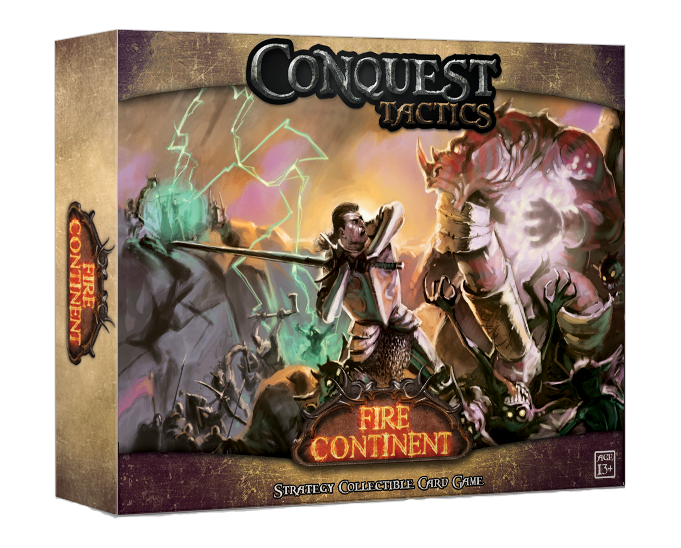 Right now, it looks like the place to buy Conquest Tactics is at their site.